Matamp GT-something. Model is unknown since this is a custom build. Matamp would not relinquish the schematic but they did try to help by offering insight into some of my questions about the circuit, so cheers to them somewhat. Looks like a Rolls Royce. Gotta be pretty baller to own one like this. There are a handful of circuit board/turret boards here but only four are really important. And also as an aside the boards are PCB turret boards. I don’t think I’ve seen that before. They are routed like a PCB but components are mounted on turrets in a high grade fashion. Very easy to work on and very rugged. Anyway, board on the way left just has a few transistors and opamps but don’t let it bum you out they just control channel switching and the LEDs on the front panel. 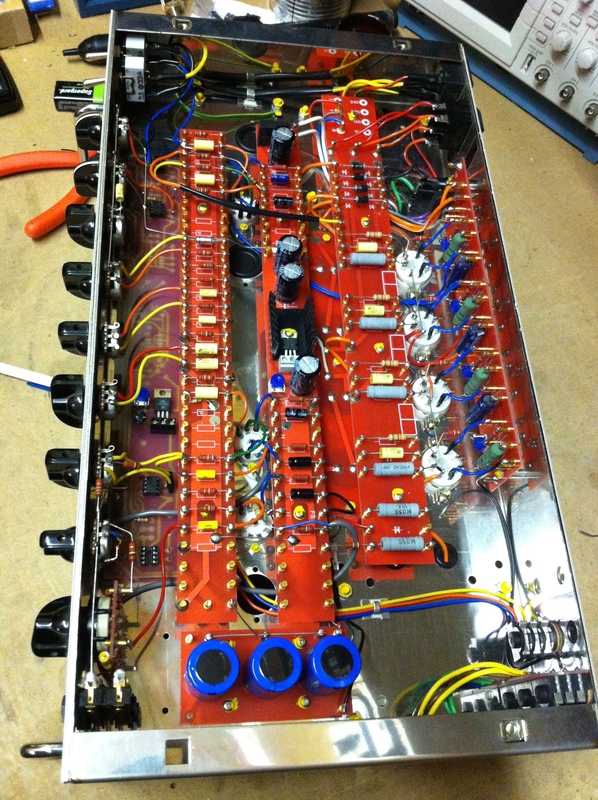 Next to left board (elevated) has resistors and coupling caps for anodes of the preamp tubes. Tone stack is also on this PCB. 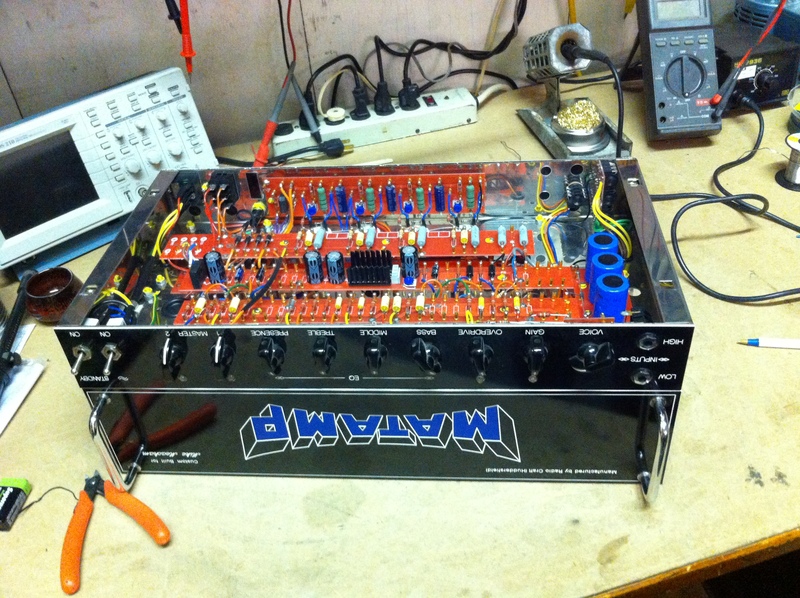 Middle board has resistors and caps for cathodes of preamp tubes on the lower half of it. Higher up are some caps which are for the DC heater supply for preamp. Next board to the right has big grey resistors. Bottom two are dropping resistors dropping HT voltage down to preamp levels. Other resistors on the board are control and screen grid resistors for EL34s. Yellow caps look like individual coupling caps from anodes of phase inverter to grids of power tubes. The four diodes up higher on the PCB are the rectifier. Right most board (upright) has heater supply for the power tubes as well as the negative bias supply. Big green resistors are 1 ohm cathode resistors (or was it 10 ohm?) to measure bias, as there are 4 individual bias trim pots, one for each power tube. However, measuring across the 10 (?) ohm cathode resistor is not a good method unfortunately in this application I must say. 4-probe bias probe comes up huge here because as you adjust one tubes current draw it changes the draw of the others. Measuring across the resistor and calculating over and over with your TI-83 would take forever. Bias probe reveals current draw per tube with the flip of a switch and frees up your TI-83 for Bowling or Drug Wars. It can do like 70W clean, about 115 max, but I guess the reason for this is because without the footswitch you cannot choose between the two channels so they basically are blended together. There is a low and high input, but with the high gain channel always on (Channel 2 I’m guessing), it will not get up to 100W clean, or whatever output you would expect from four EL34s. Each channel has a master volume. The EQ is shared between both channels. There is gain knob and an overdrive knob. I would assume overdrive goes with channel 1 and gain with channel 2. Without the footswitch they all work simultaneously. There is no information available.This is from the Dave Green era of Matamps which is I believe the 1990s. Mirrored image on the back of the front panel shows four blue power supply caps. They are shielded from the power tubes just like in the old Sound City‘s. 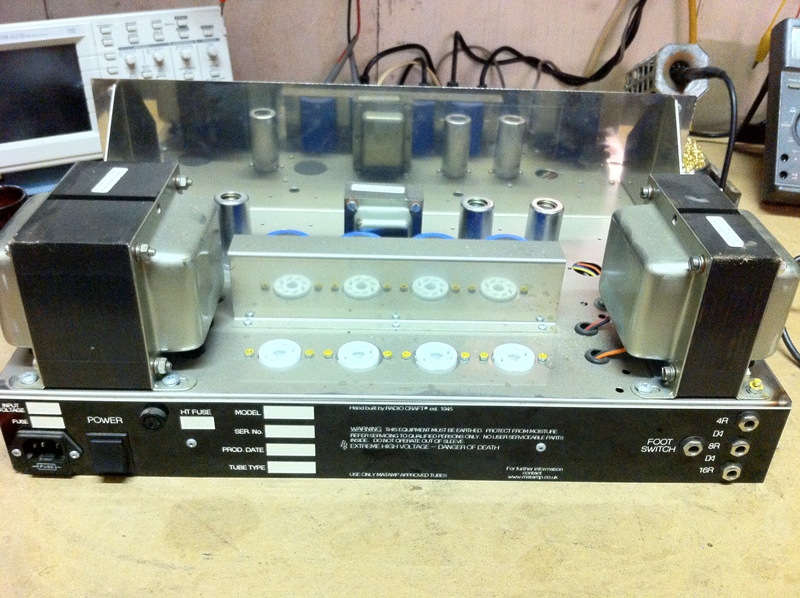 In front of them are the two preamp tubes (right), the choke, and the left most tube is the phase inverter. Power switch on the back is for half power — it shuts off two of the power tubes. I would usually not go into such detail as per the layout and inner workings of an amp, but since there is no service information or schematic available I have decided to do so in case it might help someone. 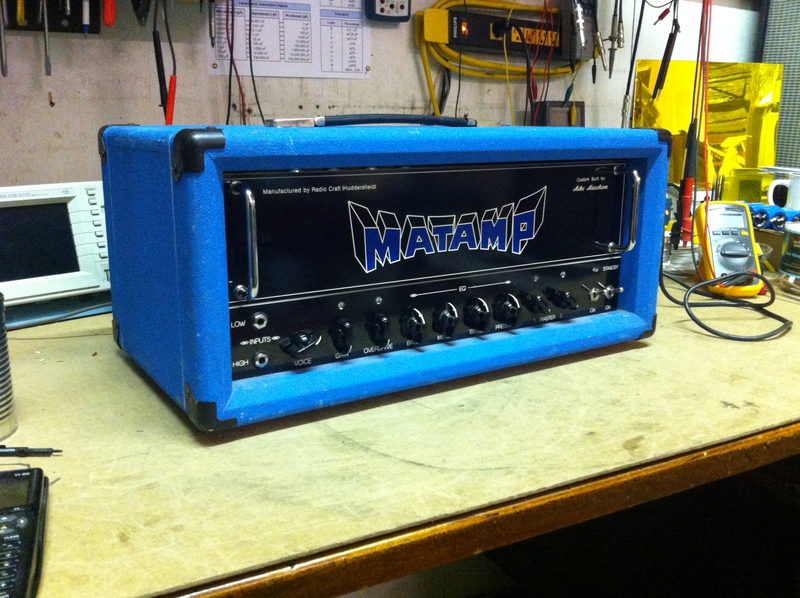 Thanks to Matamp for offering insight to this custom build.